The Ford E-Series Van was first introduced in 1960. It was then popularly known as the Ford Econoline and it served the purpose of a wagon, van and pick up. 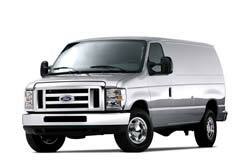 The E-series van, to be more definitive, is Ford's full-size, rear wheel-drive cargo van. In 1993 the E-series was redesigned so as to create room for improvement. Buyers looking to buy a used Ford E-series van should be pleased to learn that the E series has been the best-selling Van in the United States for over 29 years now. The 2008 E-E-Series Van was designed with the bold stylish features of the new F-series Super Duty pickup truck. This van is perfect for people who need to move a lot of cargo or in the business of transporting people. Such a vehicle would be useful as airport shuttles, ambulances and for plumbers and electricians. These days you can also get a truck that is custom made to create room for a larger variety of one's transportation needs. 2012 E-Series Van Cargo 2012 Ford E-350SD, Oxford White with 136327 Miles available now!